Background and objectives Acute kidney injury (AKI) is a frequent complication in critically ill patients and sepsis is the most common contributing factor. We aimed to determine the risk factors associated with AKI development in patients with septic shock. Design, setting, participants, & measurements Observational cohort study consisted of consecutive adults with septic shock admitted to a medical intensive care unit (ICU) of a tertiary care academic hospital from July 2005 to September 2007. AKI was defined according to RIFLE criteria (urine output and creatinine criteria). Demographic, clinical, and treatment variables were reviewed. Main outcomes measured were AKI occurrence, all-cause hospital mortality, and hospital and ICU length of stay. Results Three hundred ninety patients met inclusion criteria, of which 237 (61%) developed AKI. AKI development was independently associated with delay to initiation of adequate antibiotics, intra-abdominal sepsis, blood product transfusion, use of angiotensin-converting enzyme inhibitor/angiotensin-receptor blocker, and body mass index (kg/m2). Higher baseline GFR and successful early goal directed resuscitation were associated with a decreased risk of AKI. Hospital mortality was significantly greater in patients who developed AKI (49 versus 34%). Conclusions In a contemporary cohort of patients with septic shock, both patient and health care delivery risk factors seemed to be important for AKI development. Acute kidney injury (AKI) defined by the RIFLE classification (Risk of renal dysfunction, Injury to the kidney, Failure of kidney function, Loss of kidney function, End-stage kidney disease [ESKD]) (1) develops in up to two thirds of intensive care unit (ICU) patients (2,3) and sepsis is the most common contributing factor (4–7). 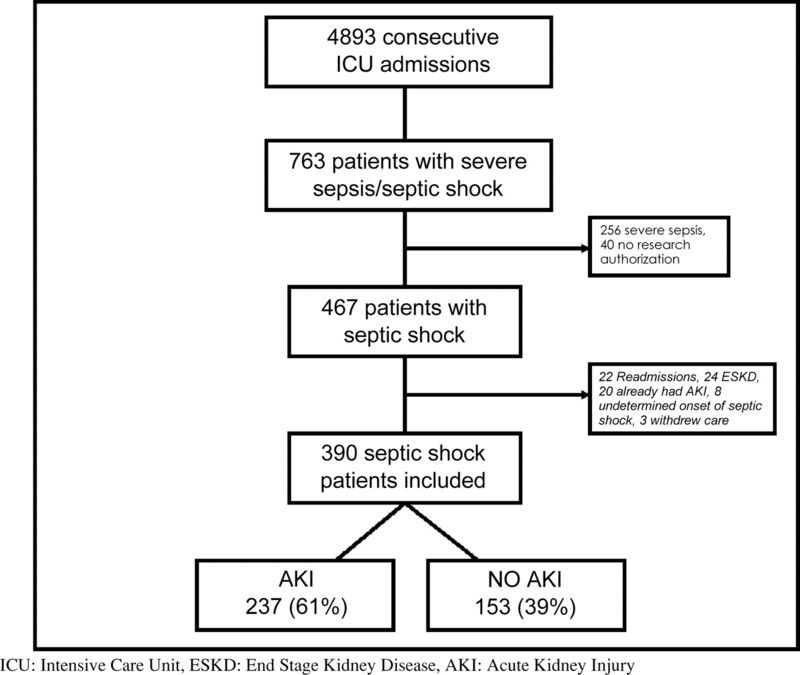 Half of AKI cases in critically ill patients are sepsis-related (4,7) and AKI develops in 31 to 65% of septic shock patients (5,8,9). Most importantly, AKI in septic patients is consistently linked to higher mortality rates and increased consumption of health care resources (5,8–10). Recent evidence suggests that septic AKI may represent a unique form of AKI with distinct pathophysiology. Patients with septic AKI have different clinical characteristics and outcomes compared with those with AKI of different etiology (4). Although AKI is often considered a hemodynamic disease, which results from renal ischemia, inflammation and apoptosis have been implicated in the pathogenesis of AKI in septic patients with hyperdynamic circulation (11–16). In a paper by Murugan et al. AKI developed in up to 25% of hemodynamically stable patients with nonsevere pneumonia, indicating that hemodynamic instability is not a prerequisite for AKI in these patients (17). Concentrations of inflammatory markers and risk of death were higher in patients with AKI, even in the absence of severe sepsis and ICU admission. Early goal-directed therapy (EGDT) in septic shock, including early hemodynamic resuscitation and timely adequate antibiotic administration, has been suggested to reduce mortality (18–20), but this finding remains subject to robust criticism (21,22). Although EGDT is considered to improve microcirculation (23,24) and was associated with lower organ dysfunction–related scores, no benefit in mortality due to multiorgan failure was proven (19). Our study aims to identify risk factors for AKI and outcome in patients with septic shock. The Mayo Clinic Institutional Review Board approved the study protocol. We performed a retrospective analysis of a prospectively collected cohort of consecutive adult (>18 years of age) patients with septic shock admitted to a medical ICU in a tertiary care hospital from July 2005 until September 2007. Patients who denied research authorization, those with ESKD on chronic renal replacement therapy (RRT), patients in whom care was withdrawn within 6 hours of onset of septic shock, those with pre-existing AKI at the onset of shock, those in whom the time of onset of shock started before hospital admission or could not be accurately determined, and readmissions were excluded from the study. The characteristics of the ICU have been previously described (25). The ICU follows an institutional protocol based on the Surviving Sepsis Campaign bundles (26). Each case of septic shock was defined according to the American College of Chest Physicians/Society of Critical Care Medicine consensus conference criteria (27). The onset of septic shock was determined when, in a patient with suspected infection, two consecutive measurements revealed the following: (1) Two systemic inflammatory response syndrome criteria (temperature >38.3 or <35.6°C, heart rate >90 beats per minute, respiratory rate >20 per minute, or white blood cell count >12.0 × 103 or <4.0 × 103); and (2) hypoperfusion as evidenced by a systolic BP <90 mm Hg or mean arterial pressure (MAP) <60 mm Hg or a fall of >40 mm Hg from baseline despite a 20 ml/kg fluid bolus, or serum lactate ≥4 mmol/L regardless of the BP (19). AKI was determined according to the RIFLE criteria (1). The RIFLE class was determined based on the worst of either creatinine or urine output (UO) criterion (based on the hourly UO). Baseline creatinine measurements (within the last 3 months) were available for most patients. For those patients without baseline creatinine values, these were calculated by the Modification of Diet in Renal Disease (MDRD) equation as recommended by the ADQI Working Group (assuming a lower limit of baseline GFR of 75 ml/min) (28). Evidence for AKI was assessed at the time of diagnosis of shock and hourly thereafter. Patients were classified according to the maximum RIFLE class reached during their ICU stay. Underlying condition before development of septic shock: demographics, source of infection, diabetes mellitus, pre-existing hypertension or congestive heart failure, chronic kidney disease (chronic kidney disease classes I through V), potentially nephrotoxic medication use [angiotensin converter enzyme inhibitor (ACEI), angiotensin receptor blocker (ARB), aminoglycosides, nonsteroidal anti-inflammatory drugs, and intravenous contrast media] within the 24 hours of development of AKI, and recent (<6 months) exposure to platinum-based chemotherapy. Severity of illness, inflammation, and hypoperfusion at the onset of septic shock: vital signs, standard laboratory parameters, lactate, arterial blood gas measurements, Acute Physiologic and Chronic Health Evaluation (APACHE) III scores, need for mechanical ventilation, and hemodynamic parameters when available. The baseline cardiovascular Sequential Organ Failure Assessment (SOFA) scores were calculated from the data available at the onset of septic shock. Severe sepsis resuscitation bundle (first 6 hours after diagnosis of septic shock) (26) and interventions assessment: time to the administration of antibiotic therapy (29), source control (30), goal-directed fluid resuscitation (19), transfusion of blood products, use of vasopressors, steroid administration, and use of activated protein C. Clinical infection definitions were adopted from “The International Sepsis Forum Consensus Conference on Definitions of Infection in the Intensive Care Unit” (31). To evaluate for antibiotic administration adequacy, definitions previously utilized by Kumar and colleagues were applied in this study (29) and are detailed in Supplemental Appendix 1. Adequate early goal-directed resuscitation was defined as central venous oxygen saturation (ScVO2) ≥70% (30) and/or a combination (at least two) of clinical factors (32): CVP >8 mm Hg, MAP ≥65 mm Hg, UO ≥0.5 ml/kg per hour, and/or improvement in mental state (Glasgow Coma Scale), base excess, or lactate at any point within the first 6 hours. Achievement of resuscitation goals after the first 6 hours was considered delayed resuscitation. Blood transfusion was defined as infusion of any blood product including red blood cells, platelets, fresh frozen plasma, or cryoprecipitate, during the 48 hours before the development of AKI or within 48 hours of septic shock in patients who did not develop AKI. Monitoring logs were reviewed and only the predictors present at baseline (before any worsening in GFR or UO) were considered for analysis. The main outcomes measured were development of AKI, all-cause hospital mortality, and hospital and ICU length of stay. Risk factors and outcomes were compared between patients who did and did not develop AKI in a univariate analysis followed by multivariate analysis. All continuous data are presented as medians (interquartile range, IQR) or means (SD), as appropriate for nonparametric or parametric data, respectively. Categorical data are summarized as counts with percentages. Difference in medians between groups was tested with the Wilcoxon rank sum test. Differences in proportions were compared using Fisher's exact test or χ2 test where appropriate. Variables were considered for multivariable logistic regression models if they occurred before the development of AKI, had <10% missing data, and the following assumptions: (1) had P values <0.1 in the univariate analysis and (2) were clinically plausible. A stepwise forward logistic regression procedure was used to derive the final model taking into consideration colinearity, interaction, and the number of patients who experienced the outcome of interest. In case of colinearity, the variable with “stronger” association (based on forward selection process) was used in multivariate analysis. Details regarding the elaboration of the final model are described in Supplemental Appendix 1. Calibration of the model was assessed by the Hosmer-Lemeshow “goodness of fit statistic” for significance (P > 0.05) (33). We assessed discrimination of the model with area under the receiver operating curve (AUROC) analysis (34). Odds ratio (OR) and 95% confidence intervals (CI) were calculated and P values of <0.05 were considered statistically significant. JMP statistical software (version 8.0, SAS Institute, Cary, NC) was used for all analyses. Out of 4893 consecutive ICU admissions prospectively screened, 763 patients developed severe sepsis/septic shock, 467 met the criteria for septic shock, and 390 met the inclusion criteria (Figure 1). The median (IQR) age of the cohort was 68 (56 to 79) years, 54% were male, and 89% were Caucasian. The median (IQR) APACHE III score was 87 (67 to 105). The source of infection was unknown in 19% of the patients and positive blood cultures were present in 19.5%. A total of 176 patients (45%) presented a positive site and/or positive blood cultures. Eighty-eight (50%) were gram-positive organisms, 74 (42%) gram-negative organisms, and 14 (8%) fungi. After review of antibiotic in vitro susceptibility of the microorganisms isolated from these individuals, inappropriate antibiotic therapy was started in 4 patients (2%). Achievement of resuscitation goals at any point within the first 6 hours of septic shock onset was successful in 189 patients (48.5%). Two-hundred thirty-seven patients (61%) developed AKI at a median of 7.5 hours (IQR 0.6 to 17) after the onset of septic shock. When classified according to the RIFLE criteria, 20.3% developed Risk, 32% Injury, and 48% Failure. Baseline creatinine was available in 97% of the patients. The diagnosis of AKI was based on UO criteria in 26% of the patients. Table 1 presents univariate comparisons of demographic characteristics, baseline characteristics, comorbidities, and medications between patients with septic shock who developed AKI and those who did not. Patients who developed AKI had higher body mass index (BMI), had lower baseline GFR, were more likely to have been on ACEIs or ARBs, and were more likely to have an intra-abdominal source of infection. Table 2 describes the differences in baseline physiologic and laboratory values between the two groups at the onset of septic shock. Of note, patients who developed AKI were more severely ill (as indicated by higher APACHE III predicted mortality and cardiovascular SOFA scores, lactate levels, and lower pH and ScVO2 measurements). Successful resuscitation and adequate antibiotic therapy were more frequent in patients who remained free of AKI (Table 3). Hospital deaths occurred in 49% of patients who developed AKI as opposed to 34% in the group not affected by AKI (P < 0.005) (Table 4). After adjustment for confounders including severity of disease, the development of AKI was independently associated with delay to initiation of adequate antibiotics (OR 1.03 per every hour of delay, 1.01 to 1.08, P = 0.04), BMI (OR 1.02 per kg/m2, 1.01 to 1.05, P = 0.03), use of ACEI/ARB (OR 1.88, 95% CI 1.03 to 3.53, P = 0.04), intra-abdominal sepsis (OR 1.98, 1.04 to 3.89, P = 0.04), and blood product transfusion (OR 5.22, 2.1 to 15.8, P = 0.001). Higher baseline GFR (OR 0.99, 95% CI 0.98 to 0.99 for each ml/min, P = 0.01) and successful early goal-directed resuscitation (OR 0.53, 0.33 to 0.87, P = 0.01) were associated with a decreased risk of AKI (Table 5). The model presented good discrimination with AUROC of 0.81, 95% CI 0.79 to 0.82, and also presented good calibration ability (goodness of fit P = 0.58). In this cohort of 390 patients with septic shock admitted to a medical ICU, nearly two thirds (61%) developed AKI defined by the RIFLE classification. Successful early goal-directed resuscitation reduced the risk of AKI. AKI was more likely to develop in patients with compromised baseline kidney function, higher BMI, intra-abdominal source of infection, delayed initiation of adequate antibiotics, those on ACEI/ARB therapy, and those receiving blood product transfusions. In addition, patients who developed AKI had higher hospital mortality. The causative relationship between sepsis and AKI is firmly established (4–10) and the incidence of AKI is high even among patients with nonsevere infections without shock (17). A recent retrospective multicenter study of 4532 patients with septic shock admitted to 22 ICUs over 16 years reported development of early AKI in 64.4% of patients (8). This investigation focused on early AKI as defined by RIFLE within 24 hours after onset of hypotension, and only considered the creatinine criterion. Moreover, it evaluated a mixed patient population (medical and surgical) with a substantial portion of the study period preceding the launch of the Surviving Sepsis Campaign. In our study, a similar percentage of patients developed AKI (61%); the incidence might have been expected to be higher considering that AKI was defined by both creatinine and UO criteria over the entire length of ICU stay. Differences in the ICU population and clinical practice may account for these discrepancies. The pathophysiology of septic AKI, although still not fully elucidated, is considered distinct from that of AKI of different origin (4,6,7,10,13–15,35). AKI in sepsis is attributed to both hemodynamic and inflammatory/immune/apoptotic mechanisms, all of which are modifiable with adequate resuscitation and antibiotic administration (14,16,23). In the study by Bagshaw et al., longer duration of hypotension and delay in the initiation of antimicrobial therapy were associated with increased odds of AKI (8). We also noted that time to appropriate antibiotic administration was significantly longer in the AKI group. Severity of disease as assessed by APACHE III and compromised baseline kidney function expressed as lower GFR were also associated with AKI. These observations confirm the findings of previous studies (6,8,36). In agreement with our study, higher BMI has been linked to renal failure (37,38) and has been shown to be an independent risk factor for developing AKI in ICU patients in general (39), as well as in specific subgroups such as septic (8) or liver transplant patients (40). It is no surprise that ACEI/ARB use was an independent predictor of AKI. In situations like shock that involve a reduction in renal perfusion, these drugs will further decrease intraglomerular pressure (41,42). Contrary to the findings of Bagshaw et al., there was no difference in age or chronic comorbidities (hypertension, diabetes mellitus, and congestive heart failure) between patients who did and did not develop AKI. The two studies, however, are not directly comparable because of the reasons outlined above. Evidence addressing the relationship between AKI and source of infection are diverse (8,9,32,36). We did not find an association of AKI with lung or urinary tract infections nor positive blood cultures. However, intra-abdominal source of sepsis was an independent risk factor for AKI. This correlation could be attributed to delayed source control (appropriate antibiotic treatment and mechanical drainage when required) or to the continuity of the peritoneal and retroperitoneal compartment, neither of which, however, could be investigated in this study. Successful resuscitation was achieved more often in septic patients without AKI. In this cohort study, criteria for successful EGDT were fulfilled in 48.5% of patients. We were not able, however, by review of the medical records to differentiate between failed attempts to achieve targets and the absence of an attempt at all. Patients with septic shock in whom resuscitation goals cannot be met despite appropriate efforts may represent a group at higher risk for AKI. Resolution of lactic acidosis was the main factor classifying patients in the “adequately resuscitated group”. Although ScVO2 and the percentage of patients with ScVO2 ≥70% was lower in the AKI group, the difference did not reach statistical significance. Two recent studies highlight the importance of lactic acidosis as a surrogate of tissue hypoxia. In a study of 300 persons with severe sepsis and evidence of hypoperfusion who were admitted to the emergency department, ScVO2 did not prove a superior target than lactate clearance for goal-directed resuscitation and the mortality rate was not reduced by ScVO2 to lactate clearance monitoring (43). Moreover, the mean levels of biomarkers of inflammation, coagulation and apoptosis, organ dysfunction scores, and mortality were significantly lower with higher lactate clearance in patients with sepsis (44). An important “hypothesis generating” finding was that transfusion of blood products in septic shock patients was independently associated with AKI. There was no statistically significant difference in hematocrit or platelet counts between patients who did and those who did not develop AKI. Although transfusions were shown to increase the probability of acute lung injury (ALI) (45) and mortality (46) in patients with septic shock, a similar relationship with AKI has not been previously demonstrated in this patient group. Perioperative and postoperative red blood cell transfusions were independent risk factors for AKI in patients undergoing cardiopulmonary bypass (47,48). An immunologic mechanism is postulated. Similarly, receipt of blood stored beyond 2 weeks has also been associated with renal failure in both blunt trauma (49) and cardiac surgery (50) patients. Additional investigations, which further define the complex interactions between indications for transfusion, type, and storage age of blood products and AKI, are clearly needed to prove an etiologic relationship in patients with septic shock. An apparently paradoxical finding is the higher CVP in patients with AKI both at the onset of septic shock and 6 hours later. The validity of CVP measurements in patients with sepsis is debated (51). CVP is used as a monitor of central venous blood volume. It is, however, influenced by multiple other factors such as cardiac compliance, venous tone, and intrathoracic pressure, all of which can be altered in patients with sepsis. In our study significantly more patients in the AKI group were mechanically ventilated and their CVP measurements could be falsely elevated. Although it is commonly accepted that a very low CVP is indicative of low intravascular volumes, there is no threshold value that identifies patients who will respond to fluid resuscitation (51–53). In mechanically ventilated patients a higher target central venous pressure of 12 to 15 mm Hg is recommended (26). This study has several limitations. Despite the prospectively collected cohort of patients with septic shock and the fact that our electronic records provide accurate information that is validated by bedside nurses, our study has a retrospective observational design with its inherent biases and potential for unmeasured confounding variables. In addition, we were not able to assess the compliance with the EGDT protocol by the treating physicians. Rather, we were only able to evaluate if the EGDT goals were met. Another limitation is the inability to assess causality as opposed to association. Finally, this investigation was conducted in a medical ICU of a tertiary referral center serving a predominantly Caucasian population, potentially limiting the generalizability of our study results. In conclusion, we explored both patient and health care delivery risk factors for development of AKI in a contemporary cohort of patients with septic shock, and both seemed to be important. Successful resuscitation reduced the risk of AKI. The development of AKI was associated with delayed initiation of adequate antibiotics, an abdominal source of infection, baseline renal function, higher BMI, ACEI/ARBs, and blood product administration. The association of blood product administration with AKI was particularly strong and requires additional study. Health care delivery factors may be potentially modified, thus contributing to the reduction of the high incidence of AKI in patients with sepsis. The contents of this manuscript were presented in abstract form at the American Thoracic Society International Meeting; May 14 through 19, 2010; New Orleans, LA (Am J Respir Crit Care Med 181: A4088, 2010).